President Reagan and Lucky aboard the Marine One helicopter. 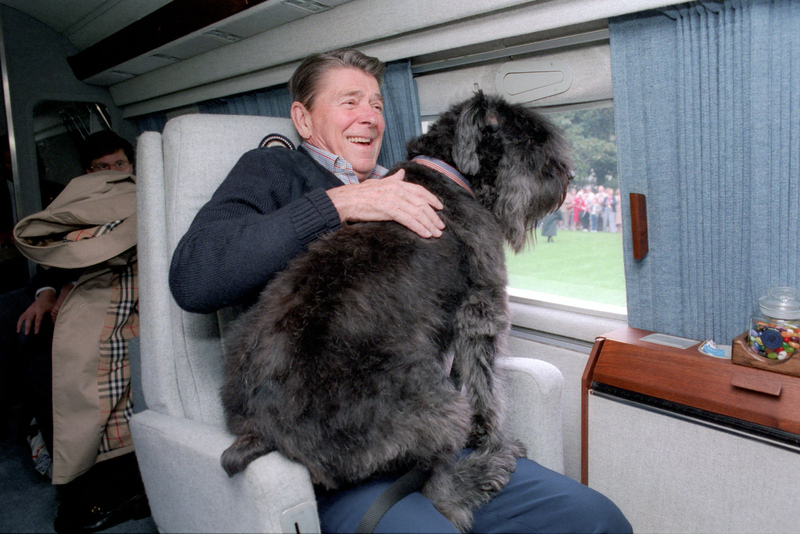 One of the best photos of presidential pets shows a delighted Ronald Reagan seated at the window of the presidential helicopter Marine One with a large black dog on his lap. That dog is Lucky, a Bouvier des Flandres who grew from a “ball of fluff” to “be the size of a pony,” according to First Lady Nancy Reagan. Although they were confirmed animal lovers who enjoyed spending time outside at their California ranch with horses and dogs, the Reagans moved into the White House for the first of two terms dog-less in 1981. March of Dimes poster child Kristen Ellis, age 6, changed that by giving Lucky to Nancy Reagan at a White House ceremony on December 6, 1984. 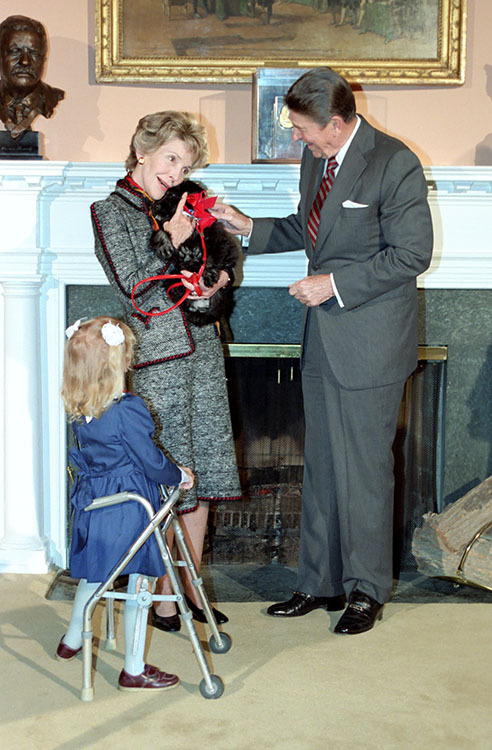 Mrs. Reagan named the 9-week-old puppy Lucky in honor of her mother, Edith Luckett (“Lucky”) Davis. The Reagans hold Lucky the puppy as Kristen Ellis looks on in the Roosevelt Room, Dec. 6, 1984. Photo courtesy Reagan Library. As a Bouvier des Flandres, Lucky’s breed originated in Belgium for the purposes of herding cattle and pulling carts. Early breeders were farmers, cattle merchants, and butchers. The American Kennel Club describes Bouviers as steady and fearless and useful as both a family friend and as a guard dog. The breed does require plenty of room to roam and exercise, as the Reagans were soon to find out. She thundered down the halls of the White House and of the West Wing. Lucky especially enjoyed visiting Camp David, and Mrs. Reagan later recalled that Lucky would get very excited when she saw Marine One because she knew it meant a trip to the presidential retreat. 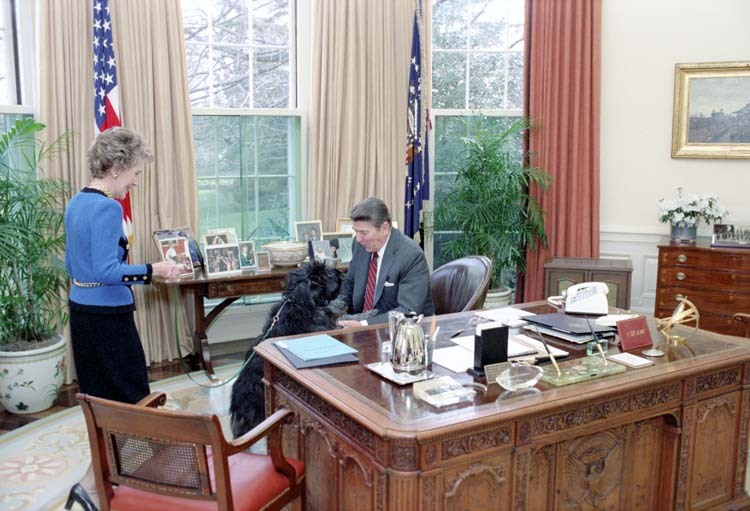 Lucky checks out the Oval Office, March 7, 1985. Photo courtesy Reagan Library. Despite some attempts at training, Lucky did not really adjust to White House life. The boisterous dog often pulled the president along on her leash. Another great photo of Lucky shows the large dog “walking” the president on the White House lawn while he is trying to have a conversation with visiting Prime Minister Margaret Thatcher. Both the president and Mrs. Thatcher seem to be enjoying the moment thoroughly. 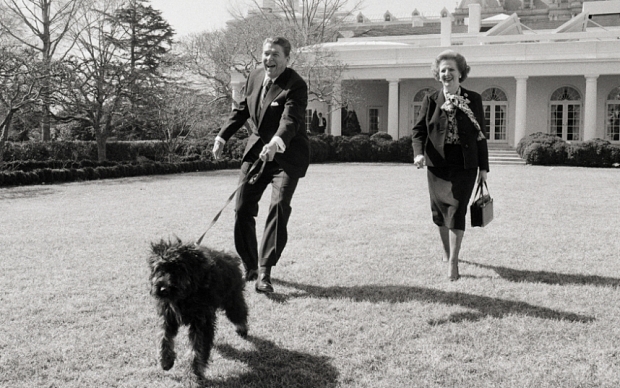 Margaret Thatcher and President Reagan walk Lucky, Feb. 20, 1985. Ultimately, the Reagans determined that Lucky was not a good fit for the White House, so they sent her to their ranch in California during the Thanksgiving holiday in 1985. On the rare days when he could escape the pressure cooker of the Oval Office, President Reagan took his wife to their beloved Rancho del Clelo, where he donned western-style clothes. Lucky died Jan. 5, 1995 at age 10 and was buried at the ranch. A postcard from the Reagans. Lucky is especially near and dear to the Presidential Pet Museum. That’s because Lucky inspired the very idea of this museum. 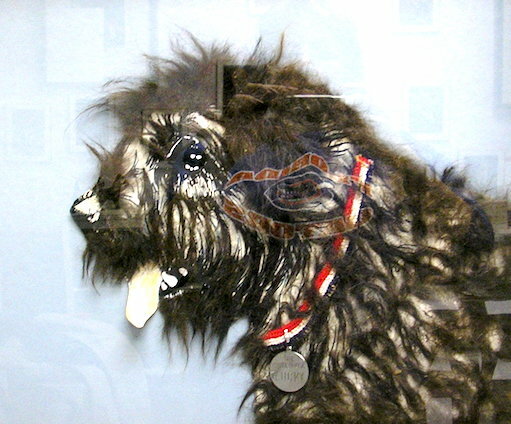 Claire McLean, museum founder, was Lucky’s groomer. She saved a bit of the top dog’s hair, and Claire’s mother created a very unique portrait incorporating the hair into it. That was when Claire decided that she and her mom had created a historical artifact worth saving. They began collecting more and more pieces of presidential pet history, and thus was born the Presidential Pet Museum. Lucky portrait, featuring the dog’s real hair.